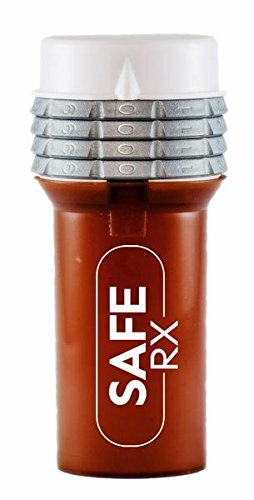 The Safe Rx Locking Pill Bottle is designed to help keep prescription and OTC medication safe at home or on the go. Designed for security and affordability, and tested for child-resistance and to be senior-friendly. Easily opened with a 4-digit combination (pre-set on the lock before it ships to you), it will help keep toddlers, kids, teens and visitors from accessing your medication. Helps keep your medication secure from kids, teens, visitors, household service providers. Certified Child-resistant and Senior-friendly. Suitable for solid oral drug powders and solids. Prevents pilfering, and tamper-evident. Easy to use pre-set 4-digit combination lock code. Great for travel, work, dorm rooms or on the go. Helps keep your medication secure from kids, teens, visitors, household service providers. Certified Child-resistant and Senior-friendly. Great for travel, work, dorm rooms or on the go. Helps prevent pilfering; tamper-evident. Easy to use pre-set 4-digit combination lock code. Small bottle: 4.5" tall x 1.25" diameter (approx. 140 small pills); Large bottle: 5.4" tall x 2" diameter (approx. 300 small pills). Be sure to see our Kits that include Encoders, to set your own combinations. If you have any questions about this product by Safe Rx, contact us by completing and submitting the form below. If you are looking for a specif part number, please include it with your message.